Control, you must learn control. Dogbyte Games' newest release, Offroad Legends Sahara, is a free-to-play expansion to the developer's hit iOS title, Offroad Legends, which is available to download for just $0.99. Although this freemium physics racer only contains four vehicles and eight levels, that doesn't mean it's devoid of strategy. If you have trouble preventing that monster truck from exploding, this brief cheats and tips guide will help you cross the finish line. Experiment with all of the game's trucks, and you'll soon realize that each one handles differently. There's a huge difference, for instance, between the FireStar monster truck and FreezeCo ice cream truck. With this in mind, pick the vehicle you're most comfortable with, but also know that some rides may prove more useful than others, depending on the objective and track layout. When playing Sahara for the first time, it's easy to fall into the trap of just mashing the accelerator to go as fast as possible. Thing is, the game's a bit trickier than that. You'll need to carefully build up enough speed to fly off ramps and do loops, then slam on the brake to avoid dangerous landmines and molten lava. Speaking of which, the brake is your friend during Lava Jump challenges, where you need to land on a specific target without falling into the hot death below. See those left and right arrows on the bottom of left corner of the screen? You'll need a mastery of both to prevent your truck from tipping over. Pressing the left button spins it counterclockwise, while the right makes it turn clockwise. Once airborne, you must press both to maintain a vehicle's balance so it doesn't land nose or rear first, which brings us to the next tip. 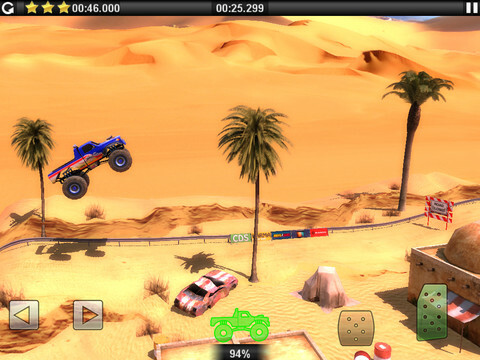 During play, it's possible to lose wheels and explode, forcing you to restart the track. Trucks take damage from just about everything, from slamming into a gate to landing awkwardly. On the positive side, you can always check the current state of your vehicle via the damage indicator (this goes from 100 to zero) on the bottom of the screen. You can unlock the FreezeCo ice cream truck by either rating Offroad Legends Sahara on the App Store, or liking it on Facebook. Both options are accessible from within the game.